own streams of effortless income! Do you really want to live your day waking to an alarm clock, commuting to work, spending eight hours on a job being stressed, and then coming home drained? Or would you rather take the day off and make twice as much money as you currently do? You can do it — if you understand the Millionaire Matrix. It’s so much easier than you think. Just look at what these people have to say. . .
Just wanted to write and give you the details of a very successful transaction that I did a few weeks ago. I ended up making $19,845.60 and learning a lot. Your materials not only taught me, but also cranked up my enthusiasm. Thanks again! I'm on my way!" "Your information has positively changed my life forever. I don't have to take on jobs or clients anymore. I have a net worth of $800,000. I live off my positive cash flow. Banks are fighting over my business." "Saved Me Hundreds of Thousands"
"I believe my time spent with... [these ideas]... cut years off my learning curve, which, ultimately, saved me hundreds of thousands of dollars in mistakes." Using the Millionaire Matrix... and dozens of other wealth secrets... Robert G. Allen is showing thousands of people a much easier way. He teaches the way to wealth and personal freedom is through setting up multiple automatic "streams" of income — effortless trickles of money coming in that build into lifetime rivers of wealth. By building five to 10 small streams of income — some bringing you $5, $10, $25, $40, and more, these little trickles of money can keep coming in like clockwork — building to $100,000 a year. You don't have to build just small trickles of income. Inside our exclusive, new program Robert will show you how you could enjoy streams that bring you $200,000, $500,000, or $1 million a year. You may be asking, "How hard are they to set up, and how hard is it to maintain them?" It's easier than you think. And the nice thing is, after your streams are set up, they work almost on auto-pilot. You don't have to be there. At the most, it may take you an hour a day to manage your streams. Isn't that a lot better than what you're doing now? In addition to making more money and having more free time, you get more security! Right now, if you lost your major stream of income — your present job — you'd be in big trouble. But if you had several streams of income, and one suddenly soured, you'd have the others to fall back on. How can you set up automatic streams of income? As you'll see in a minute, it is very simple. In fact, there are hundreds of ways to do it. Until recently, most were the closely guarded secrets of the very wealthy. You can learn all about them in our exclusive new program Multiple Streams of Income for a New Millennium, by Robert G. Allen. As I said before, Robert has shared new moneymaking secrets with us that you won't find anywhere else. This is his newest, most advanced system and it is only available through Nightingale-Conant. You may have heard of Robert G. Allen. Thousands of people have become millionaires thanks to his colossal bestseller Nothing Down, in which he showed people how to buy property with nothing down. "Send me to any city, take away my wallet, and in 72 hours I'll buy an excellent piece of property using none of my own money." "With a reporter at my side, I went out to prove them wrong. Without a penny in my pocket, within 57 hours, I owned six properties." you won't find ANYWHERE else! Today, real estate is nothing like it was even five or 10 years ago. As Robert will show you inside his new program, the wealth opportunities in real estate are still there... if you know where to look. The "gold rush" of the new millennium. Discover where the gold is today and how to stake your claim. Auto-preneuring... a new system for creating multiple streams of automatic income. How to use two words to turn on your "Ultimate Money Machine." Big Banks have a very Big Secret. Robert pulls back the curtain and shows you how to cash in using this Secret. Discover "9 Millionaire Questions" that convert your ideas into a lifetime of effort-free income. Make a fortune with the "Five Rings of Riches." A man lost his job when he hit retirement age. Knowing that he couldn't live off his old-age pension, he figured out a simple way to make some money. He had a recipe for a dish that he thought was pretty good. It was for chicken. So one day he walked into a restaurant, asked for the owner, and made him a proposal. He told the restaurant owner that he would give him the recipe for nothing as long as he got a few cents each time someone ordered his dish. The restaurant owner laughed, saying that he had plenty of chicken recipes and didn't need another one. But, after several rejections, one restaurant owner finally agreed. The man with the chicken recipe was Colonel Sanders, and, his restaurant chain is called KFC. As the saying goes, "The rest is history." How about you? Do you have a friend or family member with a great recipe for a dish that people always rave about? Maybe it's for a cake or pie, a roast, a barbecue sauce or salad dressing? Why keep it to yourself when you can make easy money from it — the kind of money that keeps rolling in every year in the form of royalty payments? Not only are restaurants looking for new dishes, so are the big food-processing companies. And when one of the big companies buys what you've got, get ready to party. But let's not limit it to food. Companies are always looking for good ideas and are willing to pay handsomely. Remember the mood ring that changes color with heat? A man had an idea to use the material in the mood ring to measure the charge in common household batteries. He took the idea to one of the large battery companies and suggested they put a battery tester on each package using the material in the mood ring. All he asked for was a few cents each time they sold a package of batteries. They rejected his idea. Undaunted, he went to their competitor, Duracell, and made them the same offer. They agreed. Duracell's sales went up over $100 million, and the person with the idea earned millions. Every day people are buying Duracell Ultra batteries with Power Checker strips... and every day this man's bank account is feeling the trickle of dollars coming in. Imagine a million dollars from a simple idea. But making money from recipes and inventions is just one of the many ways to have money coming in year after year without working for it. Inside this Nightingale-Conant exclusive program, Robert G. Allen will reveal all of them to you. into my life day after day! I want to order now for a limited-time, special price. Robert G. Allen is renowned for his ability to help people make money without working and without spending a ton of money. The old adage, "You have to spend money to make money" is a myth, he says. Instead, you have to know how to grow money to make money. When you plant a tree, do you sweat and labor to make it grow? No. You step back and let nature do the work for you. Your wealth can grow the same way, as you'll discover in just a minute. Robert points out that people who work for a living — who have regular jobs that pay them for their "time" — will never become wealthy. The word JOB, Allen says, stands for Just Over Broke. to create "walk-away money" — multiple streams of income that keep trickling in year after year — without your having to be there. Once you set them up, these streams of income work by themselves. "Send me to any unemployment line, let me select someone who is out of work and discouraged, and in just two days' time I'll teach them my secrets and in 90 days they'll be back on their feet with $5,000 in the bank." "The media challenged me to do it. And I did. I went to an unemployment line, selected three people, and taught them my money-making secrets, and they did it! In fact, one of them went on to earn $100,000 in the first year." I'm going to show you how you can do the same thing... how you can get out of your JOB... make a lifelong six-figure income... and do it in the next 90 days. The most important step to becoming wealthy without working a great deal is to enhance your current thinking. You see, as long as you maintain your current view, you'll keep yourself trapped in a life of "financial limitations." But adopt these 7 simple "mind shifts", and it's like turning the key in a door that opens a new world of "overflowing financial opportunities." You have to stop renting your brain out to the highest bidder. As long as you're selling X hours for X dollars of salary, you'll stay stuck in a "linear trap" — which means, when you stop working, the money stops coming in. Robert says, "When you produce something, you must own a piece of it somehow." And the best type of ownership is a lifetime stream of residual income. We're not living in the '50s — when a family could survive on one income. And it's not even the '70s or '80s — when two income streams were needed. We're in the 2000s — when multiple streams are needed. Why? As I said earlier, for the added security that comes from a cushion of sources. "But make sure," Robert points out, "that your streams come from diversified sources, and from completely different economic activities." He will show you exactly how to do just that inside Multiple Streams of Income for a New Millennium as he shares with you hours of techniques, and secrets you won't find anywhere else. What I'm talking about is an "instant" financial money tree that keeps growing and bearing fruit — year after year — with little effort on your part. Before you invest your time and effort in something, you first need a yardstick to measure its potential. That's where the money-tree formula comes in. With it, you'll quickly spot which avenues will create lifetime streams of income and which are just dead-end ways to make a few bucks before they peter out and die. M - Multiple Streams of Income. Your first goal is to add another stream of income to your life as a safety net for when other streams of income dry up. But it's important that it becomes a source of multiple streams all by itself. Robert shows you where to find them. O - Outstanding. If your product, service, or information isn't distinguishably excellent, it will eventually become a casualty of competition. The secret of creating a money tree is to do the work just once and to have the money flow for the rest of your life. N - Nothing Down. Why risk investing your money when there are lots of things you can do with little or no money down? Stay clear of anything that requires large outlays of cash — and that includes franchises. There are better ways to make money that don't need you to be there, that can easily give you a lifetime of "walk-away" money — and they're yours for nothing down. E - Employee-resistant. You don't want employees. They can be costly, as Robert discovered. He once had more than 200 employees. When he tried to downsize, he was faced with a $500,000 age-discrimination lawsuit. Listen to his other horror stories and avoid some costly mistakes. Y - Yield. Unless you stand to make some serious money, forget it. You'll hear about a woman who started a home-based business, and in less than a year she was making more than $100,000 per year. It was a real money-tree business because it generated cash flow to her even if she stopped working. T - Trend and Timing. Starting a business against the trend is like swimming upstream against the current. It's hard work. But when you choose a business that is with the trend, it's like floating downstream with the current. What trends should you keep your eye on? Right now there are five massive mega-trends that are going to explode in growth and dominate the future for years to come. Robert will reveal all five to you. R - Residual. This one is the most important ingredient for building a lifetime flow of easy money. Remember, your aim is to have money flowing to you when you stop working — year after year. E - Essential to Everybody Every Day. Whatever you sell, try to pick something that's essential, or is perceived as essential, by a large segment of society. E - Enthusiasm. The more enthusiasm you have for what you're doing, the more successful you'll be at it. Find something you love. There are hundreds of opportunities to create a lifetime stream of income — all with very little or no serious work involved. Inside Multiple Streams of Income for a New Millennium you'll find several hundred ideas and wealth-building secrets – many of which are only revealed inside this program. If you are even a bit curious about the program, I urge you to order today and begin building your new wealth immediately. I'm confident that you're going to LOVE it. You'll see just how simple, fast, and easy it is to create multiple streams of income that allow you to be wealthy without working… starting incredibly soon, and continuing for the rest of your life. P.S. You can be earning up to $1,000 per week in as little as 90 days. One person went from zero to $3,000 a week in 60 days. That's $150,000 a year of extra hassle-free income... for life! Find out how you can do the same. Take advantage of this limited-time discounted offer today. YES, I want to discover proven ways to have money automatically flow into my life day after day. 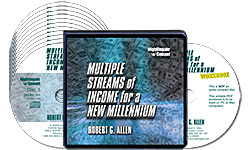 Please send me Robert Allen’s audio program Multiple Streams of Income for a New Millennium - including the 11 CDs plus writable PDF Workbook - for just $119.95, which is $30 OFF the regular program price. Take advantage of this limited-time special discount now! Click below to buy with confidence from Amazon!